Sit-ups are one of the most popular ab/core exercises out there, and have been so across strength, power, fitness, and sports training for some time. Many coaches and lifters look at sit-ups as a way to “build core strength”, lose belly fat, or simply to train the abs; however this may or may not actually be the best exercise to do so. Some research suggests that sit-ups could be problematic for lower back health, however other coaches and trainers disagree. In this sit-up exercise guide, we will set out to present everything you need to know about sit-ups so that you can make your own decision on whether or not you think adding them (and their variations and alternatives) is best for your clients, athletes, or personal training program. Below is a step-by-step guide on how to properly set up and sit-up, specifically the bodyweight sit-up. Disclaimer: Sit-up training may or may not pose a risk to the lower back/spine, and therefore should be done at one’s own risk. 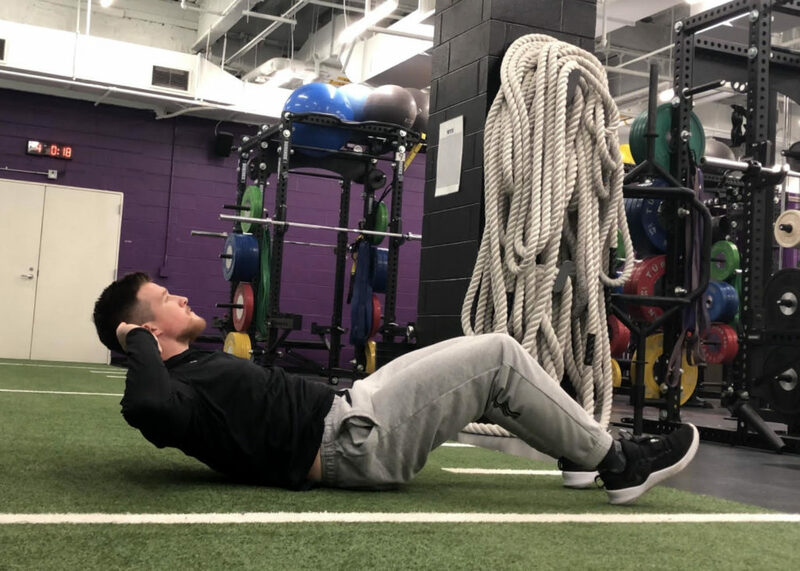 Many coaches and researchers have found that while sit-ups are widely used as a popular abdominal exercise, they actually can be responsible for high amounts of compressive forces placed upon the lower back when performed incorrectly. However, there is no definitive answer as to whether or not this time-tested core exercise is good or bad, and therefore we want to arm coaches and athletes with the necessary information to think and take action on their own. Additionally, we have offered up other core exercises below to build strength and muscle while steering clear of sit-ups for those individuals who would like to minimize lower back health concerns (again, as a coach, I have no opinion on whether or not sit-ups are good nor bad at the moment). Start by lying supine on the ground so that your chest is up. You can place a small mat under your lower back if you would like. It is imperative that you contract the abdominal prior to the movement. It is important to not go into excessive amounts of flexion and extension in the lower back during the sit-up. To do this, think about moving the torso as one unit, rather than curling your chin, chest, belly, and hips upwards in a non-uniform manner. Time under tension is key in this movement, as it can limit the overall need for volume and increase muscle activation of the abdominals. Focus on flexing the abdominals throughout the full range of motion, starting from beginning of the lift off to at the top of the exercise. Once you have made it to the top of the sit-up, you need to then lower yourself down with complete control. Often, lifters will simply flop, drop, and/or smack their bodies towards the floor for the sake of doing more reps, faster. When looking to build serious core muscles, adding endless repetitions isn’t always the best way, and often can lead to injury. Instead, slowly control the movement down, using your abs. Once you have softly made contract with the floor with minimal lower back extension, repeat for reps.
As you will read in the below sections, sit-ups and whether or not they are destructive to the lower back, have been at the center of discussion among trainers, coaches, and physical therapists for quite some time. We are here to present both sides of the sit-up discussion, we want to also urge coaches and athletes to look at various other abdominal and core training exercises that can not only increase core strength and muscle hypertrophy/endurance, but also have a more direct application to strength, power, and fitness sports. Therefore, we have included a few articles that coaches and athletes can use to better maximize core training specific to their respected sports below, and offer potentially “safer” core training exercises in lieu of sit-ups (if you agree with the below sit-up contradictions). How Often Should You Train Abs? 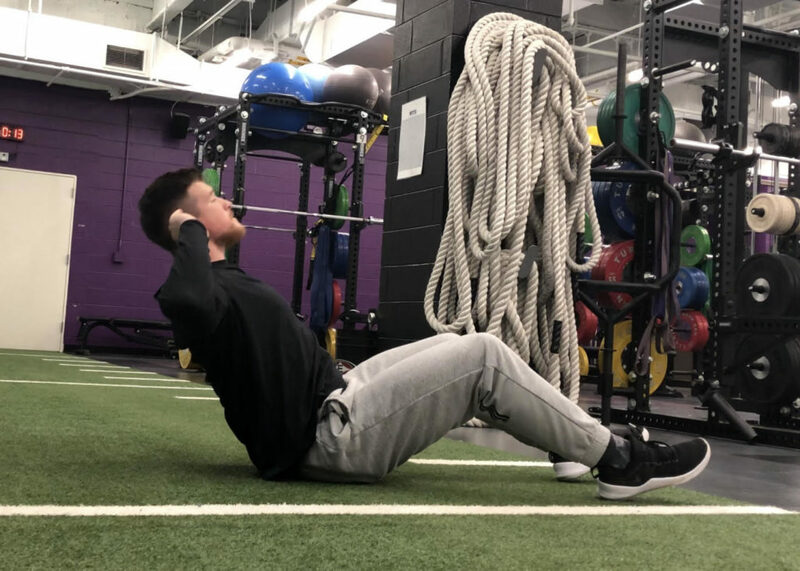 Below are three (3) benefits of sit-ups that coaches and athletes can expect to gain when integrating the sit-up within a sound strength and conditioning training program. Again, these are general benefits of core and sit-up training, and may or may not be limited to just the sit-up (which is why we have included many other variations, alternatives, and safer alternatives if you are not a fan of sit-ups). The sit-up is often used as an abdominal exercise to increase muscle hypertrophy and endurance (in the rectus abdominis and hip flexors). For individuals looking for increase core stamina (such as runners, boxers, etc) the sit-up could provide a good training stimulus. The sit-up requires no equipment to perform (just bodyweight) making it a popular go-to exercise for on-the-go workouts, at-home training programs, or simply to do anywhere, anytime. That said, adding in some other core exercise (such as the ones above) will result in overall greater abdominal development, core stability, and improved injury prevention. The sit-up is a progressed version of the crunch, which makes it a good exercise to start with individuals who may lack equipment or have been able to progress from the crunch properly. It is important to note that the sit-up, while simple in theory, does require a lifter to establish core stability and control of the spine and hips throughout the range of motion, otherwise lower back issues may arise. Be sure to progress properly and adhere to proper technique and movement standards, especially with beginners. Dr. Stuart McGill, a leading professor and researcher in the field of human biomechanics has made a case against the sit-up, suggesting that it has the ability to subject the lower back to high amounts of lumbar stress which can lead to chronic back pain and issues. In his research, he concluded that every single repetition of a sit-up can produces more than 3000 Newtons of compressive force onto discs (1). While some do criticize his research due to it being mostly conducted on dead pigs (which, however have been shown to have very similar spinal structures to a human), the case against sit-ups and their risk vs. rewards is an interesting one. Dr. McGill goes on to say that you can perform similar movements, such as the “McGill Curl-Up” and place lower amounts of stress on the junction, minimizing injury risks. In the below video, Dr. McGill discusses in-depth about his case against sit-ups, lower back injuries, and what core exercises can be done to build strength and minimize injury. The sit-up is a bodyweight exercise (however it can be done with weight, bands, etc) that targets the abdominals and the hip flexors, both of which are responsible for hip and spinal flexion. The sit-up targets the rectus abdominal muscle during the concentric and eccentric phases of the sit-up. It is important to note that the lower back (lumbar spine) can be kept neutral while still targeting these muscles. The hip flexors assist in the sit-up movement, as they are responsible for hip flexion. This muscle is often active in other core exercises (such as leg lifts, knee raises, etc) and is beneficial to sprinting and running performance. Below are some reasons why strength, power, and fitness athletes can benefit from performing the sit-ups. While most strength and power athletes subject their bodies to high amounts of core stress and loading, some supplemental exercises can aid in further development of the core muscles. That said, this sit up could be used as an abdominal specific exercise to develop muscle hypertrophy and endurance. Coach’s Note: It may not be advised for some lifters as the sit-up could increase lower back stress, which is often already a trouble spot for some lifters. For this reason, the above “safer” sit-up alternatives may actually be a better option, in addition to bracing and breathing techniques. The sit-up, specifically GHD and ab mat sit-up variations are very common within CrossFit and functional fitness workouts/competitions. For this purpose, there is a sport specific need for these exercises. The sit-up is commonly used in general fitness programs as a means to increase core strength and develop the abdominal muscles. That said, the goal of most individuals training the sit-up is to see visible abs and/or increase core strength, which may in fact be more easily accomplished by higher intensity training protocols, isometric and anti-rotational core training, and dietary restriction. While sit-ups can help to increase core strength as a whole, coaches and trainers may find more bang for their buck performing movements like landmine rotations, planks, weighted carries, squats, and other total-body exercises. Below are two primary training goals and programming recommendations when using the sit-up in programs. Note, that these are general guidelines, and by no means should be used as the only way to program sit-ups. For increased muscular size and hypertrophy, the below repetitions can be used to increase muscular loading volume. Some lifters may want to train greater muscle endurance (for sport), in which higher repetition ranges and/or shorter rest periods are recommended. You can also hold for pauses and add time to the set (see pause pull-ups below). Below are three (3) sit-up variations that can be used by coaches and athletes to keep training varied and progressive. 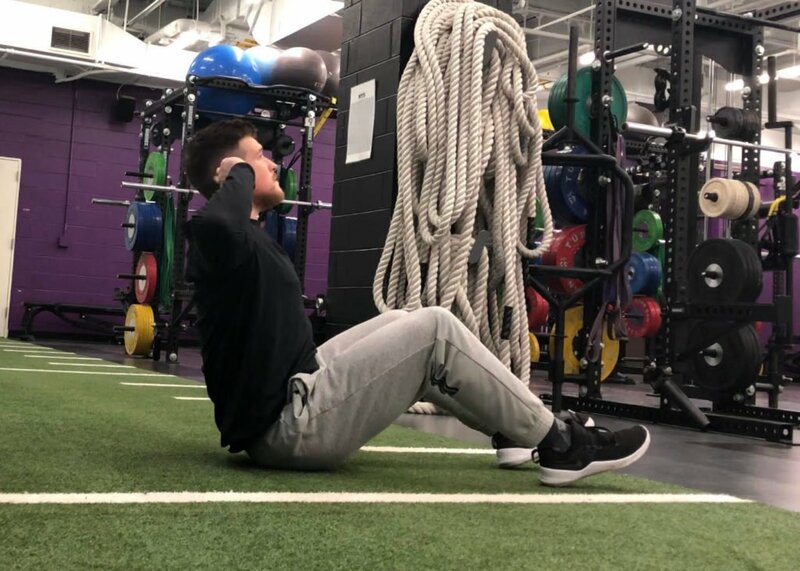 It is important to point out, that performing sit-ups and the below variations may or may not pose a potential risk the lower back (due to high amounts of hip/spinal flexion and extension), however many coaches and athletes will use these without any issues. The decline sit up is a sit-up performed on a decline bench, which increases the amount of hip extension the lifter is placed in. In doing so, the range of motion is much larger than a standard sit-up, increasing the need for hip and spinal flexion. This exercise could be a good transition exercise between standard and GHD sit-ups, as it limits hyperextension of the spine yet still challenges the core and hip flexors in the sit-up. The GHD sit-up is often seen in functional fitness training programs, and is a progressed version of a standard sit-up. In this variation, the range of motion is significantly larger than standard floor sit-ups, which could both increase difficulty AND potentially increase lower back stress. Coach’s Note: It is important to note that going into excessive extension and flexion has been seen to produce high amounts of compressive force on the discs in lumbar spine. For this reason, this exercise should be limited in volume and intensities, and mastered with controlled and less ballistic ranges of motion prior to adding speed or load. Lastly, some coaches and athletes may find that performing partial repetitions (goes only into slight extension, if any) can increase difficulty and core strength without potential strain on the lumbar spine. The cable/banded sit-up is done to add resistance to the sit-up movement, increase core activation, and reinforce muscular control throughout the entire range of motion. This variation can be good to also increase time under tension which can help to minimize overall repetitions needed to stress the muscle groups and force a lifter to slow down and control the movement (which can aid reinforcing proper movement mechanics). To do this, athletes can perform a sit-up while having a cable or band attached behind them. As they sit-up, the band is stretched/cable stack is lifted, making sure to control both concentric and eccentric contractions. Below are three (3) sit-up alternatives coaches and athletes can use to increase abdominal strength and muscle hypertrophy/endurance. Both the hanging knee/leg raise are core exercises that target the same muscle groups as the sit-up. The lifter can lift the knees rather than straight legs as a regressed core exercise, working up to straighter legs for added difficulty. As discussed above, the sit-up can be a tricky exercise for individuals who may be prone to lower back injury. That said, Dr. Stuart McGill, leading researcher on this subject, has come up with his solution to the sit-ups vs. lower back compression forces dilemma, which he goes over in the video above. The ball slam is a dynamic and ballistic core exercise that reinforces core strength and provides a powerful metabolic component to core training (which is key for shredding body fat; in addition to healthy eating). Try swapping ball slams in for sit-ups to shift your core training routine into the next gear.